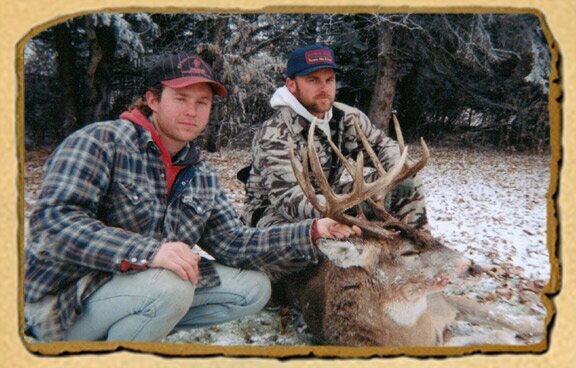 One of the ultimate challenges for the serious trophy hunter is the cunning and elusive Whitetail Deer. Hunting huge Whitetails at the peak of the rut is a hunter's dream. At Shadow Creek Outfitters we offer some of the finest Whitetail Deer Hunts available in the province of Alberta, Canada. We offer this hunt at the peak of the Rut each November. Most mature Alberta Whitetail bucks weigh in between 250 to 300 lbs on the hoof and will carry a rack in the 140+ range, with 180 to 190 class Whitetail being taken each Fall. We take pride in providing our hunters with great opportunities on outstanding trophy class Whitetail, and with many of the recent winters being mild we know that most of our mature bucks are surviving the Canadian winters. This means the best hunting is yet to come. Our hunting area is ideal for Whitetail Deer hunting. Located in Wildlife Management Units (WMU) 505, 506, 510, and 250, the hunting areas feature deer-attracting fields which have a rich mix of grain and alfalfa and have small hills and numerous tree lines. Growing up in this area, your Outfitter Henry Giles does extensive scouting year round and for every hunt, and we set up ground blinds and ladder stands where you will have the best results.